An article in The Telegraph has highlighted the charges local councils are hitting householders with for collecting garden rubbish or for taking it to the nearest tip and have labelled it a ‘stealth tax’. Charges differ across the country but apparently more than a third of councils in England are charging up to £90 per year to collect garden rubbish from residents homes on top of council taxes. Statistics from The Sunday Telegraph show that out of 326 local authorities 111 of them now charge for collecting garden rubbish. This charge is usually around £30 to £50 to use the service but Harlow District Council charge £90 for a fortnightly garden waste collection. There are often additional costs such as the cost of a special wheelie bin or you have to pay ‘per bag’ for single use garden waste bags. Shockingly, the article also says that some councils are charging between 60p and £1.50 for garden waste bags, but then these are just being collected and dumped into landfill with all the other household rubbish collected. DIY Doctor strongly believes it is better to recycle whenever possible, so if you have the outside space, you can save on all these costs by recycling your garden (and kitchen) waste and using a simple compost container. 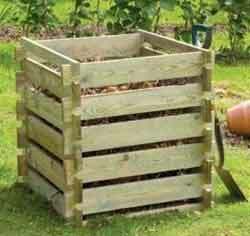 Our project on building a compost container gives step by step instruction on building a wooden compost bin. Or you can always buy one like the one pictured above. Once set up, maintenance is low and you get great compost for your garden!! A no-brainer if you ask us!! Neweys conduct Solar PV market research and need your help!